*This site is a free online resource that offers valuable content and comparison features to consumers. To keep such resource 100% free for consumers, DatingWebsites.com receives advertising compensation from the companies listed on this page. Such compensation impacts the location and order in which such companies appear on this page. The factors listed below impact Our Ratings on this page. All such location, order and ratings are subject to change. DatingWebsites.com does not include all dating sites available to consumers in the marketplace. For the most part, we tend to understand when someone says, “online dating just isn’t for me,” despite the plethora of dating sites that are popping up seemingly every day. But perhaps that’s just it – maybe there are simply too many sites to choose from. And just because one site worked for your best friend doesn’t mean it’s right for you. So, where do you turn as a single seeking the perfect personal match? Our #1 choice, Zoosk can be extremely helpful for people who need help jumpstarting their love lives. 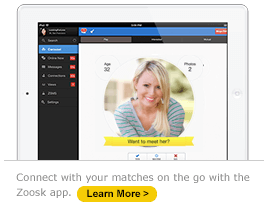 One of the coolest things about Zoosk is it functions like a social network and a dating website, all in one. This makes its services more fun and engaging to use, giving you a fluid interface that integrates its browsing features well with its chat and messaging as well. 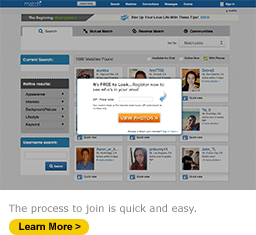 As far as signup, there are two ways to register with Zoosk. The traditional method requires visiting the website and creating a profile. However, because Zoosk began as a Facebook app, it should not be surprising that singles can also create an account via the company's Facebook app. Super easy! And with over 25 million members to choose from, you shouldn’t have a problem finding someone you click with in no time. Zoosk’s matchmaking technology is head and shoulders above the rest, and its myriad of methods of interacting and finding singles should introduce you to so many people that you’re almost certain to find members you’re attracted to. Plus its SmartPick Behavioral Matchmaking engine learns more about your preferences the more you use it, curating information to help introduce you to people you’re likely to be interested in. You can view local Zooskers and give them a wink or write them a message to let them know you are interested. A similar feature, the Carousel, let’s you riffle through profiles rapidly, deciding between “Yes,” “Maybe” or “No” for each member you see. With such smart and personalized service features, it’s easy to see why Zoosk ranks as our #1 dating website overall. Just be yourself – whether you’re looking for friends, a fun fling, or long-term love, Zoosk is our best option for mitigating the hassle that goes into finding a special someone. EliteSingles steps in to offer a strong alternative for sophisticated singles tired of hookup apps. The belief is that you shouldn’t have to hide your success in order to appear more modest in your search for a special someone. EliteSingles is the perfect place for like-minded professionals of all races and genders to meet and find lasting love. If you’re nodding your head in affirmation so far, you could really enjoy how EliteSingles removes the distracting features other dating sites offer in favor of a cleaner, more formal approach. The profile search is very efficient and is based on the criteria you provided during your free personality test (which you’re able to modify at any time). One of the main reasons many hardworking professionals have trouble finding love is because they’re simply too busy. EliteSingles adjusts to your lifestyle, weeding out trendy users in favor of those who are more dedicated to finding love. Check out your “Profile visitors” while viewing your matches to see who’s been checking you out, or click “Communication Status” to see where your last conversation left off. This is ideal for busy singles with work, life and other goals on their minds. 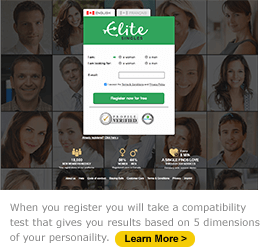 Admittedly, what takes the most time is EliteSingle’s compatibility test, which you take upon registering to the site. The test covers the “5 dimensions” of your personality, and while lengthy, the test usually results in higher-grade matches and long-stayed relationships. It’s also completely free as part of the overall signup. You can also see and receive messages at no cost! No wonder EliteSingles ranks so highly with us. There’s a common misconception that once a person reaches their senior years, they shouldn’t search for love anymore. Nothing could be further from the truth. OurTime has successfully helped thousands of seasoned singles find new companions and long-term partners. 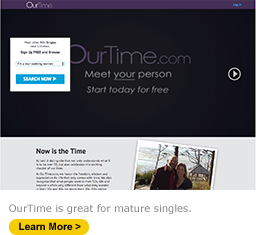 One of the few dating services specifically aimed at the 50+ market, OurTime has actually achieved a much broader appeal based on its user-friendly design and abundance of features. Driven just as much by personality factors as it is by the ability to search its membership base easily, OurTime will help you find several interesting local matches in very little time. The site also provides you with five daily matches based on personal preferences, in essence connecting you with the people you’re looking for faster. Most of OurTime’s features are designed to introduce you to people, meaning you’ll spend most of your time either searching for matches or building your profile so that you can make a serious connection. Both processes are refreshingly easy and customizable, allowing you to build a profile that reflects exactly who you are or, conversely, search for the exact type of person you’re looking for. Once you begin browsing profiles you can Save, Flirt, or Message any match you’d like to get to know a little better. OurTime even makes it a little easier by sending you 5 Daily Matches, which allow you to quickly decide whether or not you’d like to pursue these compatible members. Match.com is the first dating site most people ever heard of, and that’s way before the recent boom. Launched in 1995, Match totes the type of longevity and brand recognition you’d want from a dating website (or any service provider). But this isn’t just a company that relies on its name; Match is adding to the thousands of long-lasting relationships it has inspired every day. If that’s the type of person you are, someone looking for something serious and less fleeting, this is probably the matchmaking service for you. So, what makes Match so effective? Its in-depth survey uses data about your personality, interests, physical characteristics, lifestyle, religion, and much more to offer you 5 potential matches every single day. While the survey could take a bit of time to complete, the amount of consistent, on-point matches it proposes is quite worth it in our opinion. Match features the largest pool of daters out of our Top 5 sites, astronomically upping your chances of meeting someone worth your time. Sure, there are plenty of niche dating sites out there aiming to zero in on your interests, but with the success of online dating depending so highly on how many people you’re willing to give a shot, why not favor a much bigger site that works diligently to understand exactly who you are? Plus, with its Reverse Matching technology, you can also see who is looking for someone like you, meaning you don’t have to do all the work. Like Match.com, eHarmony is one of the original dating websites out there. The site currently features over 20 million members in 200 different countries, showing no bias against any particular type of person. Its “29 Dimensions of Compatibility” questionnaire goes deeper into your personality than most initial registration tests, making sure that not only can you find true love now but that it’s sustained long into the future. While most dating services aim to link you with a special someone and that’s it, eHarmony zeros in on your “Core Traits,” those intangibles that fuel happy marriages and catapult them into a healthy future. 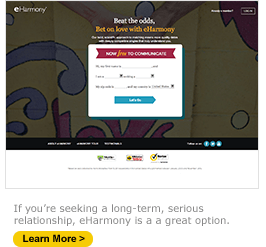 You’d be happy to know eHarmony boasts 44,000 member weddings annually, and there’s no reason why you can’t be next! So, now that we’ve laid out the goods for you, what’s your pick? If by now you’re still uncertain, go ahead and give Zoosk a try. It’s our absolute favorite dating site and one of the most popular on the market, using its colorful setup to connect millions of fun-loving singles. Driven by eye-catching designs to make your experience as stress-free as possible, Zoosk is your best bet for a potent and intoxicating blend of romance and fun. As our #1 online dating site overall, it’s not a bad place to start your quest for love. But don’t just take our word for it, try Zoosk out for yourself. Good luck! Not all submitted reviews are posted but all submitted reviews are factored into our rating. Datingwebsites.com believes the posted reviews best reflect the overall opinions of all submitted reviews. Copyright© 2019 DatingWebsites.com. All Rights Reserved.